Last month Amazon announced the launch of a whole range of new Alexa-powered devices that went beyond just smart speakers. While some markets like the US get the microwave oven, wall clock and the new smart plug, for now, Australia's choices are limited to the next generation of Echo speakers... which admittedly still gives us a wide range of new gear. Amazon promises that the third-generation Echo Dot is 70% louder than the second-generation hockey puck-like speaker, and comes with a fabric body. Of course, Alexa will always at your beck and call. Amazon has given its biggest speaker a makeover, making it better looking than the predecessor thanks to its fabric finish. But the retail giant has also given the internals a boost. The Echo Plus now makes use of 3-inch neodymium woofer, and a 0.8-inch tweeter, for punchier bass and clearer mids and highs respectively. You can now even pair two Echo Plus devices for stereo sound. 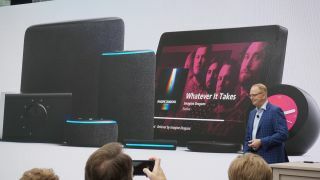 The second-generation Echo Show features a Full HD 10-inch screen and an upgraded audio system that includes two side-firing speakers and one passive radiator. That means you get great image quality along with big sound. There’s also a 5MP front camera for video calls and taking pictures, plus you can connect any smart security system to keep an eye on your property. If you already own an Echo smart speaker, you can get bigger sound for less than $200 by wirelessly pairing it with the all-new Echo Sub. There aren’t too many features to boast of here, but you will get 100W of deep bass sound through a 6-inch woofer.